Siebel SmartScript allows business analysts, call center managers, and Siebel developers to create scripts to define the application workflow for interactive customer communications. The script determines the flow of the interaction, not the agent or customer. · Script: The object that contains all subsidiary content and procedural elements for directing the workflow for an interaction. It consists of a name and a collection of pages, and the branches needed to move between the pages. · Page: The logical grouping of questions within a page that display together for the user. · Question: A script element that is a question to be asked of customers, or a text message that provides information to the agent. Questions are displayed on pages. · Answer A script element that represents an answer to a question. Answers appear as data entry fields or as any of several types of UI elements, including check boxes, drop-down lists, and multi-value groups. · Translation: A text string used to display script elements in languages other than the original, so that scripts can be used in multilingual call centers. · Branch: The transfers of control inside a SmartScript that define the display and processing sequence of pages or questions. Script branches transfer control from a question in one page to a question in another page, while Page branches transfer control from one question to any other question within a single page. NOTE: Page branches override script branches. · Page section: The logical grouping of questions within a page that display together to the user at one time. system. Data stored in answer tables can be extracted for external processing by using the Siebel Enterprise Integration Manager. ■ In a particular business component field. 1. Understand your business scenario, and map out your design. 2. Create questions and translations. 4. 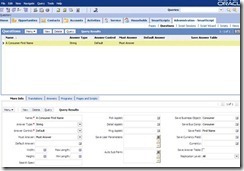 Create pages: In the First Question field, select the question that you want to appear first on the page. 6. Add questions to pages. 7. Add pages to the script. · Answer Control: What input field will be used Dropdown, radio button etc. · Must Answer: Used to make a Answer required. Some of the Questions may have predefined answers when the Answer Control is Dropdown, Checkbox or radio button. · First Question: First Question to appear on the page. Once all the pages are linked, a branch is seen in the Branches tab. If there are no errors following screen will be seen. After Clicking the Release button in the Translations tab the “Released” flag will be checked and the Released date will be populated. RunCallScript, invokes a SmartScript from an applet so the SmartScript updates the currently active record. RunCallScript positions the SmartScript on the currently active record from the applet from which the SmartScript was invoked. This can be invoked by filling in the Method invoked property of the button to be RunCallScript. We will try to invoke this method using a custom button. 3. Map the Control to the Applet Placeholder using “Edit Web Layout” option. 4. Compile the Applet object. 7. Click on the Clear Cache button. SmartScripts can run automatically when a user navigates to a particular view. In this example when the user Navigates to the Consumer List View the SmartScript should start automatically. To configure SmartScripts to run automatically, add the SmartScript Player applet to the view, and associate a SmartScript with the view. 2. You may also need to add the concerned BusComp to the BusObj. 4. 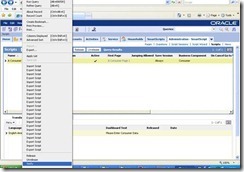 Navigate to Administration – SmartScript screen > Views view.The list of available views appears. 5. Select the view that activates a SmartScript when this view is accessed. RunSmartScript: This function invokes a SmartScript programmatically. This function has extra parameters View Name and Applet Name. The viewName parameter allows a view other than the default agent’s SmartScript view to be accessed. This is useful if an alternative view is configured for a specific purpose. The view specified must contain an instance of the SmartScript Player Applet to present the SmartScript interface to the agent.